We love coffee. Like, ridiculously love coffee. There is something about that first sip of a coffee you know is going to be great, and you drink it and your brain explodes over the goodness that is that perfectly brewed delicious coffee! Our favourite coffee we get back home is a flat white (naturally, as it was created in Australia!). Flat whites are not something we come across often in the States. We’re pretty pedantic about how the flat white is made. It HAS to come in a small, ceramic cup, not a glass and needs to have minimum foam on it! We figured pretty quickly that if we asked for a 8oz wet cappuccino with one shot, you’ve pretty much got a flat white! Now this has little relevance to mocha bliss balls, other than the fact that they contain coffee…and can be enjoyed with coffee…and that they kind of taste like heaven when you eat them (like a good coffee should)! 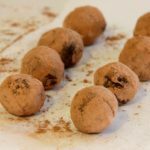 These mocha bliss balls are fudgey, delicious, easy to make and are a great little 3pm pick up with the coffee hit. Word of advice however, unless you are completely immune to coffee, we wouldn’t suggest eating these after dinner! George found this out the hard way one night and was awake until 1am. These are great because you can freeze them as well and just take one as you need it! You should get about 10 bliss balls from this, which should last a week if the two of you eat one a day. They also make beautiful gifts wrapped up in cellophane with a ribbon tied around it! 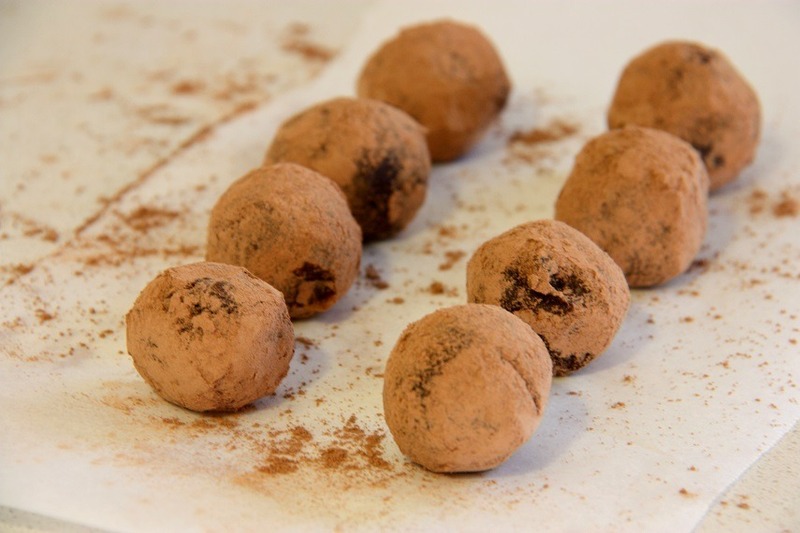 Chocolatey, with a kick of coffee, these mocha bliss balls are a fantastic pick me up! Blend the dates with coffee until smooth. Place almonds/walnut meal, cocoa, chia seeds, cinnamon,coconut oil and salt in blender with dates and blend until nice and smooth. 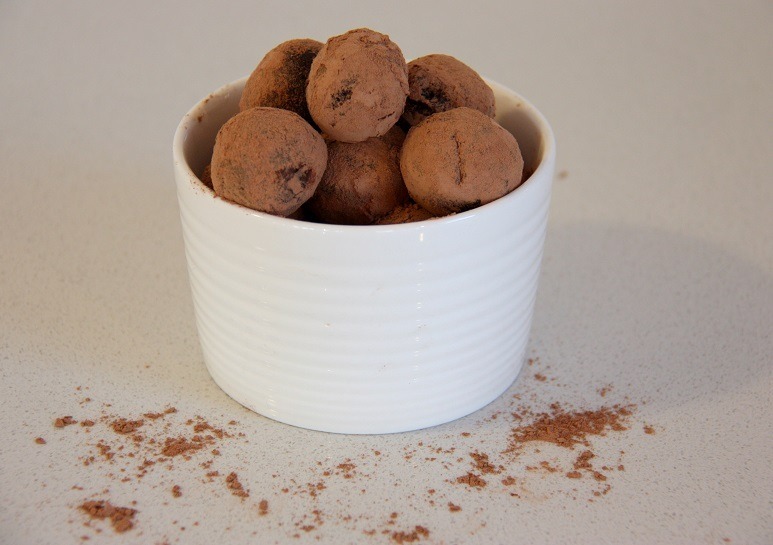 Take a large teaspoon of the mixture and roll into bite size balls. Roll in cocoa and enjoy! If mixture gets a little sticky when rolling, set in the fridge for 20 minutes or so. If you want more of a coffee kick, add a double shot. All things coffee and chocolate yes please! These look amazing and addicting! Thanks Rachel!!! these are two of our favourite combos!